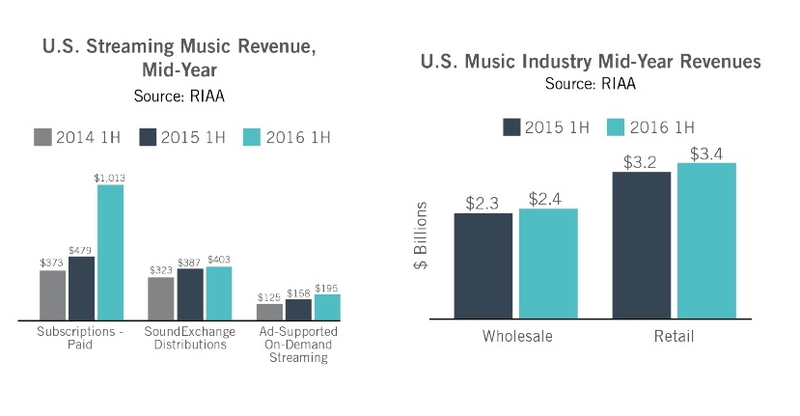 Notably, the total number of people paying for a subscription to one or more service more than doubled over the previous year, to 18.3 million, indicating that the increase in revenue from streaming services was not simply due to bigger upfront payments or minimum revenue guarantees to the labels, which are often opaque to artists and other stakeholders, but was instead due to increased participation in the subscription business by consumers. The value of the average paid subscription — essentially industry ARPU — increased to $9.23, from $8.77 in the first half of last year, thanks largely to the launch of Apple Music, as well as Tidal’s $20 per month premium tier. Some analysts downplayed the significance of the increase in streaming revenue, or at least its magnitude, noting that Apple Music was not around for most of the first half of 2015, so the “comp” isn’t all that comparable. But the impact of Apple on the 2016 results is actually a cause for optimism, not simply a statistical anomaly. It indicates that the entry of a well-capitalized new player expanded the market for paid streaming considerably, rather than merely redistributing market share. Turns out, having Apple and Spotify going at it led to more people paying for music. It’s a lesson the industry should take to heart. Markets with a lot of competitors tend to be more dynamic that markets with fewer competitors. The CD business was never so robust as when it was at the peak of its retail footprint. The more that other people are investing in the market to sell your product the better. The best thing the labels could do to nurture a dynamic, growing market for paid streaming is to encourage more competitors to get into it. That means allowing room for streaming services to experiment with market segmentation, compete on price, and respond to shifts in consumer tastes and habits. Fortunately, the industry seems to be getting the lesson. Pandora last week announced a new, $5 per month paid tier that offers more interactivity than its free tier but less than more expensive paid services. Broadcast radio giant iHeartMedia is preparing to launch two new paid streaming services, at $5 and $10 a month, respectively, according to reports. Amazon is also reportedly looking to launch two new streaming services, one for $10 a month, and one for $5 a month exclusively for owner’s of Amazon Echo wireless speaker. Finding a way to get all of those new paid services into the market and letting them go at it can only be a good thing. That’s particularly true of new paid tiers from platforms that were built on free, like Pandora, iHeartMedia and YouTube Red. 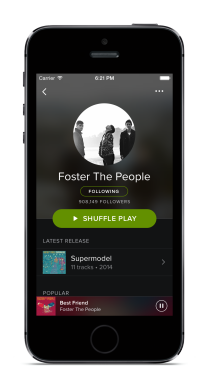 According to a recent survey by MusicWatch, free services account for 80 percent of all streaming in the U.S. But you need to fish where the fish are. This being the music industry, or course, it can’t help shooting itself in the foot, even as it stumbles forward. Last week, two of the three major label groups, Universal Music Group and Sony/BMG, began rolling out their own, direct-to-consumer streaming service in the U.K. under a new joint venture called Now That’s What I Call Music. According to Reuters, the labels are eyeing a possible future expansion into other territories. The move has already attracted the attention of antitrust watchdogs at the U.S. Justice Department. But even if the service passes legal muster it’s a dumb idea. Going into competition with your own customers is a poor way to attract more customers into the market. I understand the abstract appeal of cutting out the middleman, but in this case, middlemen are driving what growth the industry is seeing, as the impact of Apple’s entrance into the market plainly shows. The labels will be lucky of DOJ shuts them down.